ProteusPay is a plugin for WordPress that connects the leading industry platforms – WordPress, EDD, and FastSpring. Accept payments using 14 different gateways in 18 currencies, don’t deal with taxes, and enjoy all the benefits of having total control over your website. ProteusPay is the ultimate eCommerce + website solution for businesses who want to focus on selling their digital products online and don’t want to lose their hair dealing with taxes, payment gateways, the website itself, and break the bank on accounting costs. You’ve been working for months on your digital product and the release date is getting close. At this point it’s very frustrating to realize, that setting up a website, finding the right payment gateway for your customers, and dealing with all the taxes & invoicing will be much more complicated than you’ve anticipated. Every country has different laws and if you are located in or you are selling to EU, you have to collect the taxes at a rate defined by that country and also pay your taxes to local authorities. This is not a good solution for small to medium businesses. However, not complying means you’re at risk that the taxmen knock on your door any day. Are you willing to take that risk? We’ve been in the same situation a year ago with our theme shop business, ProteusThemes. Fortunately, after months of research and of trial & error, we’ve finally connected the dots and found a solution that works exceptionally well. ProteusPay is a reliable eCommerce solution built on top of two award-winning platforms - WordPress and FastSpring. It comes in a form of a WordPress plugin and it includes best of both worlds. WordPress is the most popular CMS today which is powering about one-third of the entire web. It allows you to build your website quickly and customize it to your needs. Easy Digital Downloads is a free plugin and de-facto solution for selling digital products on WordPress. It’s powering more than 60.000 eCommerce stores, ranging from single landing pages to large online marketplaces. FastSpring is award-winning SaaS solution for eCommerce. Its main feature is that it removes all your VAT/GST and other digital taxes liability. It supports most convenient gateways for global payments, subscriptions, and more. ProteusPay WordPress plugin connects the three. It allows you to enjoy all the benefits of running your WordPress website but enhances the experience by adding full integration with the FastSpring eCommerce platform. FastSpring allows you to focus on your business and removes all your digital VAT/GST liabilities. FastSpring acts as merchant of record. On the paper, they sell your product, so they are responsible for sending the invoices to buyers. FastSpring allows your customers to pay using their credit card, PayPal or even less common options such as bank transfer or Amazon pay. We’re running a WordPress business itself (with the same plugin) and we’ve been closely working with the EDD and FastSpring technical teams so the plugin is as reliable and well supported as you’d expect from the eCommerce solution. You can configure that customers pay you in 18 different money currencies. Let FastSpring do the currency conversion automatically or override the local prices. The easier and faster it is for the users to complete the purchase, the better your conversion rates will be. You can see on this page how the FastSpring popup checkout experience looks like - simple and efficient. And your customers don’t have to leave the site at all to complete the purchase. Recurring payments are the future of running a sustainable business. ProteusPay has you covered. You can enjoy all the benefits of the recurring revenue stream. Single time payments are the standard way of selling various digital products: games, audio, video files and e-books. EDD allows you to create more standard shop (or even a marketplace) where users can add items to your cart and then complete the purchase using FastSpring popup checkout. When you’re only selling a single product or you have 2-3 options presented in a pricing table, Buy Now buttons work great. Upon clicking the button, visitors can complete the purchase in the FastSpring popup which boosts your conversion rates. Knowing what’s going on in your purchase is crucial. We’ve made integrating the standard marketing tools like Facebook Pixel and Google Analytics as easy as possible. With FB pixel you will be able to retarget your users down the road. ProteusPay plugin was created with extensions in mind. You can use all of the official EDD add-ons together with our plugin. Issuing licenses and checking their validity is easy. EDD has a very popular add-on for this and FastSpring has integrations with the dedicated platforms for issuing and checking the licenses - both for online or desktop software. Leverage the power of affiliate networks who will expand the reach of your product. FastSpring has a superior integration with the industry leading Impact Radius platform. Don’t break the bank if you’re just starting. WordPress and EDD are open source software, and FastSpring allows you to start selling without any fixed fees or contracts with their Pay As You Grow plan. By using our plugin, FastSpring will allow you to use the basic "Pay As You Grow" plan, while using the FastSpring API and the subscriptions, which are otherwise reserved for the "Business" plan. So, all you need is the FastSpring "Pay As You Grow" plan, our plugin and you are good to go! Get a ProteusPay plugin. Updates and support included. Get a plugin with the setup configuration done by our team of experts. Get in touch and we'll find the best solution for you. * the Plugin package includes 1 license and can be used on one WordPress site. If you plan on using it on multiple websites, please contact us. If you are not satisfied with our plugin in any way and you don't wish to use it, then we'll refund you your money in first 30 days after purchase! Ask Us Directly! We're happy to help. In EU the biggest problem when selling online are the taxes, which are very complicated. We searched for a lot of solutions (add-ons) for Easy Digital Downloads, but there was always an obstacle we couldn't overcome. After a long search, we found FastSpring which offers exactly what we need. They take care of all the taxes and we can focus on what we do best. But the next issue was that there was no easy way to integrate FastSpring with EDD. At least until we found a great plugin developed by Proteus team which connects the two platforms perfectly. I absolutely recommend the product, as it will make your life a hell of a lot easier (at least tax wise 🙂). I’ve heard WordPress is unreliable? WordPress is powering about one third of the entire internet and this makes it the most successful CMS out there. Because anyone can use it it has built some negative reputation about being unreliable. If you put it on a cheap and insecure hosting provider and use sketchy themes or plugins you could have problems, but it’s not WordPress to blame. If you need help, we can recommend some great, reliable hosting providers which have built up their reputation over the years of hosting big and small eCommerce WordPress websites. If you’ve ever installed a WordPress and a plugin before, you will. We’ve prepared a detailed guides and knowledge base which will guide you through the setup process. With the purchase, you also get a full year of access to our support. However, if you are not sure, we can do all the heavy lifting and set up your WordPress with the plugin and configure it for you. That’s why we offer the Plugin + Setup option to buy from us. I'm new to EDD, are there any guides on how to set it up? Yes. We actually wrote our own guide on How to sell WordPress products using EDD as the underlying e-commerce platform. Even though the guide is targeted towards WordPress products, you will still find a lot of useful things, since it can be applied to other products and markets as well. Does it support Recurring Payments EDD add-on? Yes, ProteusPay has full support for Recurring Payments official EDD add-on. Actually, it's a required plugin if you will be selling auto-renewing subscriptions. Does it support Software Licensing EDD add-on? Yes, ProteusPay has full support for Software Licensing official EDD add-on. Which kind of products can I sell with FastSpring? 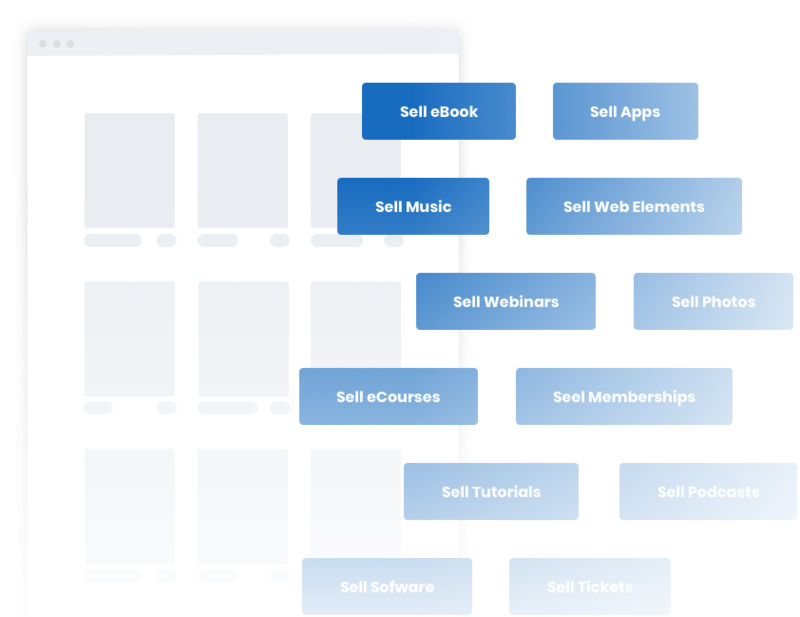 FastSpring is most suitable for people selling software (SaaS, online software like WordPress themes and plugins, mobile apps, desktop apps), e-books, video and audio files and various types of subscriptions (membership sites). How does it look like, can I see a demo? Yes, this very website is using it or head over to ProteusThemes pricing. If you want to look under the hood, we’d be more than happy to schedule a demo video call with you where we can show you how it works in the WP admin. I don’t know if it will work with my theme? ProteusPay plugin works with any decent coded WordPress theme. If you already have a site and you have doubts, please get in touch and we'll help you out. This very site is using the GrowthPress WP theme which you can buy at ProteusThemes. I am already selling on FastSpring, can I migrate to use your plugin? Absolutely. Migration for sellers who are already selling on FastSpring is easy. Our plugin supports gradual transition (where you leave the existing products as-is and only add new ones using our plugin) or a complete transition. Please get in touch for more information. I am already selling on EDD but using other payment gateways and plugins, can I migrate to use your plugin? When creating the plugin, we paid special attention to make it as integrated with EDD as possible. This allows you to easily change from other payment gateways to using ProteusPay plugin and FastSpring. All you'll have to do is to install and configure the plugin, then select FastSpring as the only payment gateway in the EDD payment gateway settings. Why this plugin isn't available in the official EDD store? Recently, EDD team has decided to close down their store for 3rd party plugins. It's not possible to sell anymore the EDD add-ons there, so that's why you can buy it here directly from us. Absolutely. In case you are not satisfied with the plugin and it doesn't suit your needs, get in touch within 30 days from the purchase and we'll provide a full refund if we cannot provide a solution for you. Does this plugin work with the AffiliateWP? Yes, this plugin works great with AffiliateWP. However, if you are searching for an alternative affiliate system, FastSpring has a built-in integration with the Impact Radius, one of the leading affiliate platforms and you can use Impact Radius straight away. With EDD, I can create special links that add the products to the cart and go to checkout. Does this work with ProteusPay? Yes, this case is covered and works. In short, all the custom Add To Cart EDD links work, including the direct checkout links, discount codes, products, product variations & more. Will my EDD shortcodes continue working once I switch to ProteusPay plugin? Yes, we've tested all EDD shortcodes and they work with the plugin. The most interesting ones are edd_price and purchase_link which will display the price in the local currency (optional) and with all the taxes included (VAT or GST) depending on the location of the visitor. Is there a "Test Mode" available before going live? FastSpring platform supports the test mode so does the ProteusPay plugin. You switch to the test mode by selecting the Test Mode checkbox in the EDD Payment Gateways settings. In the test mode, no live purchases will be made and you will be able to thoroughly test that everything works before you go live with your eCommerce store. Can I see the change-log of the plugin? Sure 🙂 Check out our plugin change-log here. We’ve been working with WordPress for more than a decade. We use the very same plugin to run our online shop, making 6 figures in yearly revenue. We’ve been working closely with the FastSpring and EDD teams. All this allowed us to build a reliable solution for digital sellers like you.